Seán is an associate in McCann FitzGerald’s corporate group and advises indigenous and multinational corporates in relation to private company law matters, including mergers and acquisitions, contractual drafting and negotiation, private equity transactions, corporate reorganisations, joint ventures, and general Irish company law and corporate governance issues. Seán is a member of the firm’s betting and gaming group. As part of that role, he maintains an overview of legal and regulatory developments in the betting and gaming sector. 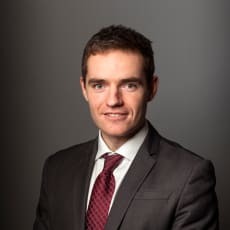 With others in the group, Seán has co-written client briefings on relevant topics including the Gambling Control Bill 2013 and an update on the implications of the pending expiry of remote bookmaker and remote betting intermediary licences. Sean spent a period on secondment in 2016 with one of the world’s largest betting and gaming operators.